Last Friday I went into the city with a friend who had moved away 13 years ago to what she calls her Azkaban - Tucson, AZ. I can understand why she calls it that, growing up in the Bay Area and having to move to the hot desert in the middle of Arizona. We went walking along one of our regular spots before she moved - Lands End, where the rocky cliffs meet the ocean, on the north western part of the city. And on a day like Friday, clear and sunny but not hot, the views were spectacular. 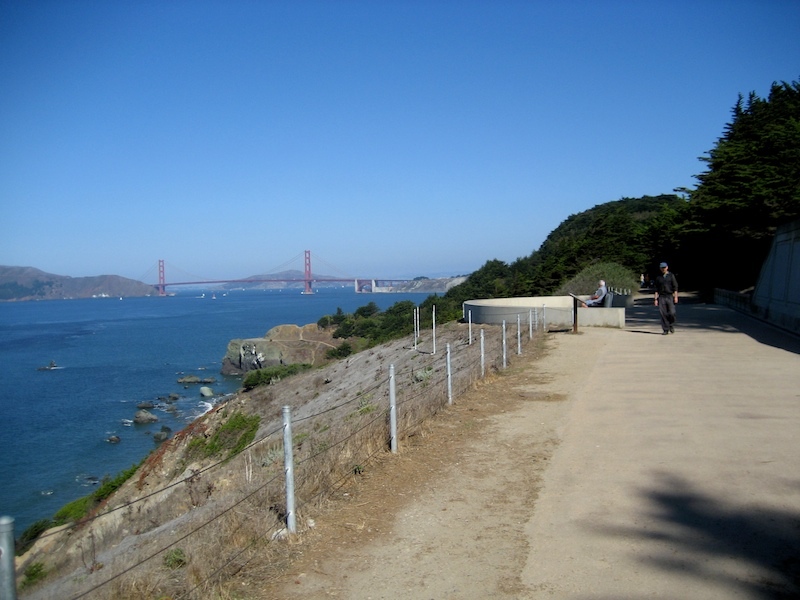 Rosemary, this is the view from the trail, right before we walked up the stairs to see the USS San Francisco Memorial. With all the fog we had a month ago when you were here, we couldn't even see the ocean much less the bridge! Last weekend was the celebration of Fleet Week where Navy ships come to the city and the Blue Angels perform to a crowd of over a million people. They come a couple of days ahead to practice and serendipitously, we were on the trail when they were practicing. 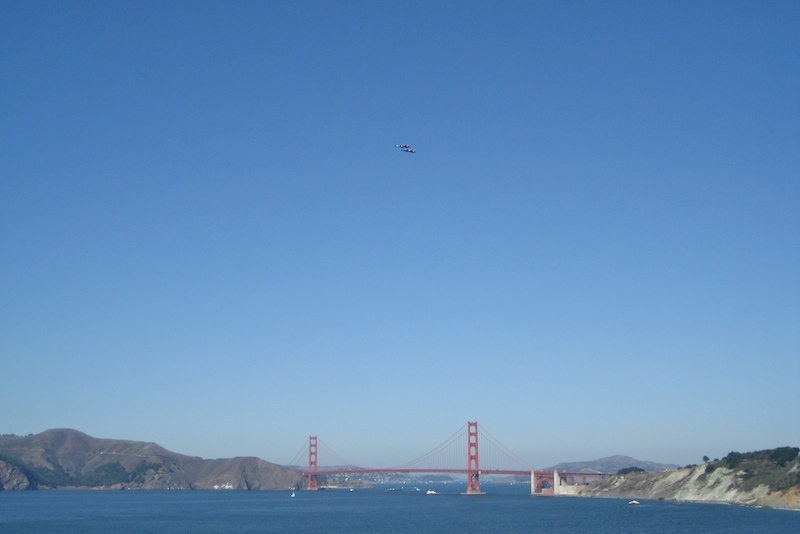 Two fighter jets high about the Golden Gate. A single jet (the speck by the 1st tower on the left) approaching the bridge, flying between the two towers. Can you imagine if you were driving on the bridge, how thrilling/exhilarating/scary that would have been? In reality, he was probably above the towers, but it certainly looked like he was below them from my viewpoint. 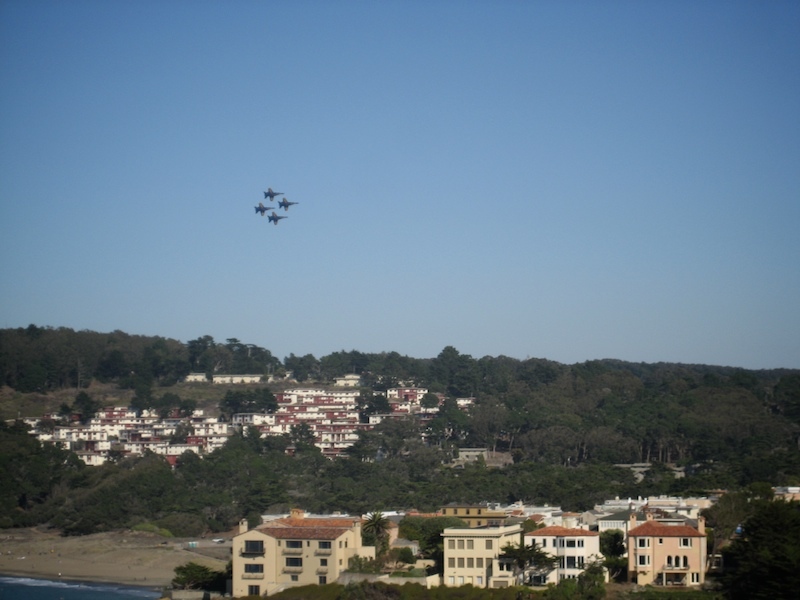 Diamond formation flying over the Presidio. I felt very lucky that we caught their practice run. In fact, they had to call off the show on Saturday due to low clouds and fog. It was still cloudy on Sunday, but they were able to perform. I think I got the best show of the weekend with the sunny blue skies. Wow, what a view we missed. It is beautiful. I have seen the Blue Angels several times in Oxnard. They are amazing....and a bit scary. 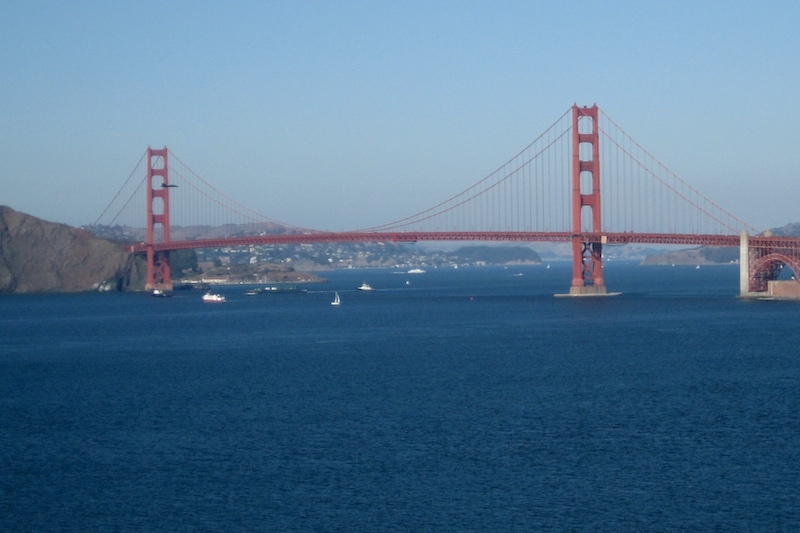 Great views of the SF bridge, I really must visit your area one day. On a sunny day, not a foggy one! You were one lucky lady, Mad, but why does that not surprise me!